We are just over a month past Solstice and already I can tell the days are getting longer, allowing and encouraging more outside work, as weather permits. Just a week ago I spent a couple of hours cleaning out the restored culvert inlets and ditches on the road up to the hill pastures, following a heavy rain event that washed bushels of fallen leaves downstream to clog anything that impeded the water’s progress. During our working visit June of 2009 Bear spent days unearthing four neglected culverts along the road up the hill, buried under years of accumulated washout and filled with roots, rocks and impacted dirt. 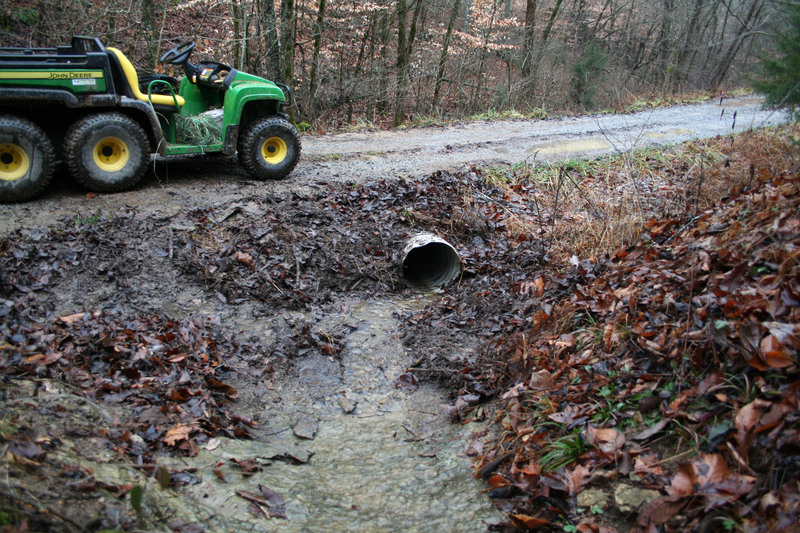 Drainage ditches and culverts are critical elements of a sustainable dirt road in hilly rain country. 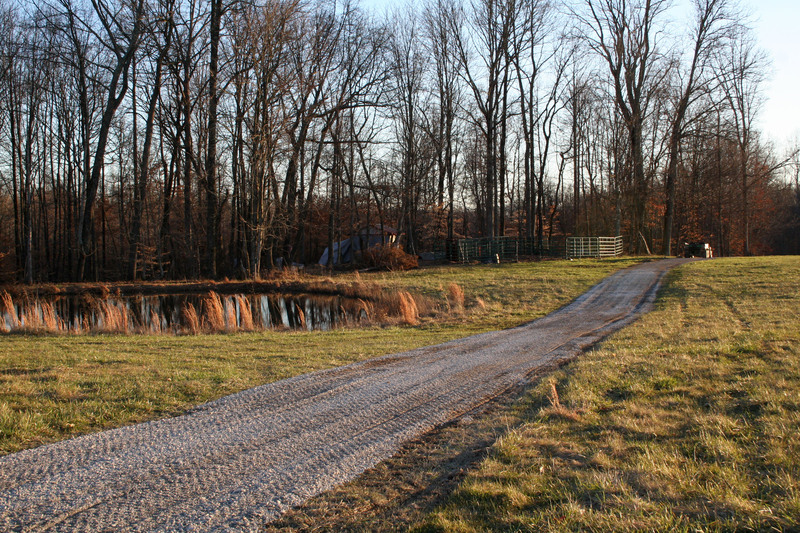 A good road has enough culverts to divert runoff every hundred feet or so, and is graded to angle into the slope so the water flows down a ditch into the culvert, instead of choosing its own course down a tire rut, unimpeded for long stretches, a destructive earth-moving force where you don’t need one. There is still a day of road-grading to do, once the leaves are all scooped up, to restore the proper drainage path of rain water into the roadside ditch, rather than the road’s ruts, which is just starting to wash out the road. Two years ago I spent several days on the tractor regrading the steep sections and encouraging the water to flow in the crease between road and hill, into the culverts and away from the road surface. It is time to do that again. Of course, I’ll need just the right temperatures and lack of precipitation, so that project may wait awhile for all the supporting elements to coincide. For now, as I can, I am laying dense grade aggregate on the portions of permanent pasture lanes I’ve established that have begun to demonstrate muddiness from either traffic or low-lying topography. It is a slow task, one that may take me all winter. Until you drive across sodded ground repetitively, you don’t know how it will hold up to vehicle traffic when rain events are factored in. My little gator, with its balloon tires and relatively light weight, isn’t a rut-maker, but the tractor is. So until I get an initial layer of roadbase laid on my driving lanes, the tractor only crosses fields in the mornings when the ground is frozen. Like this morning, when I moved two large round bales of hay from where they’d been stored to where I am forking hay out to feed. I looked at the 10-day forecast and realized I only had one more below-freezing morning before rain will likely set in, followed by a warming trend. That means mud. That means, no driving the tractor up there. So, I moved two bales of hay this morning. All good. My current pile of aggregate is frozen solid, so between rain and freezing temps the roadbuilding endeavor is much delayed. I’m fine with that, as it’s slow, monotonous work, and it would drive me crazy to do it too many days in a row. There’s always firewood to split, cows to feed, ducks to butcher, and a kitchen to paint. Spring and house guests will be here before I know it.